Looking some delicious recipes to change in your chicken recipes? 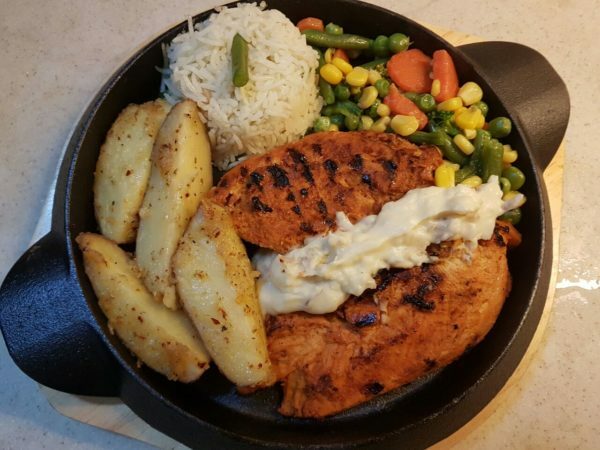 Try out an amazing Grilled Chicken Steak Recipe by Famous Chef Zakir. Marination and cooking on grill and topping with a sauce makes a scrumptious meal. Chicken Steak goes great with boiled veges, potato wedges and boiled rice. This is just perfect for weekend and if you serve in a get together it doubles the enjoyment. This recipe is also best for steak sandwich. Steak Sandwich are great to impress your friends and family. Divide chicken breast in 4 parts. Flat chicken breast with hammer. Add ginger, garlic, mustered paste, 2 tbsp Worchester sauce, salt, cinnamon powder, 1 tbsp crushed black pepper, and 3 tbsp oil into a bowl and mix well until the oil disappear. Dip chicken breast in this mixture, squeeze lemon juice on breast and up down this. Marinate for one hour. (if you are using beef add 1 tbsp papaya paste in sauce). Heat 2 tbsp oil in frying pan and stir fry plain flour. When it gives aroma, remove from heat and mix to cool. Heat the grill pan and place chicken breast on grill. Turn the flame to medium as it starts cooking. When cooked on one side flip to other side. Cook till tender but do not over cook. Dish out in a separate plate. Fry half onion in 2 tbsp oil until red then add water and cook. Cut dry red chili into two and add in above gravy. Add salt, 2 tbsp Worchester sauce and mix. Now add fried plain flour mixture slowly in sauce and mix well, increase flame. Now add 1 tbsp black pepper crush. Remove from flame and add fresh cream. Mix all well and cook 2 minutes more. Cut chicken steaks in 2 parts and arrange in serving plate, pour sauce on top. Serve with potato wedges, boiled veges and boiled rice. Mohammad Nadir. Sazi ko bhonte hove os mein chicken cube mila diya karen.